The Official Thomas Bickle Blog: Birthday Party is a go. Sorry there aren't more T pics yet. 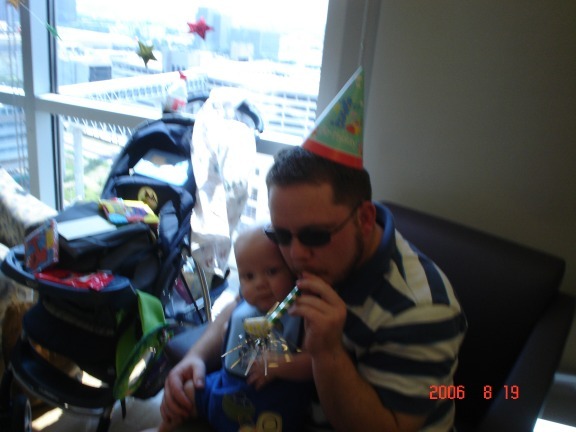 I had to hand the camera off, and the youngest guest of honor was so overwhelmed with joy that he retired early, anyway. I'm sure the grandmas will provide more pictures soon. 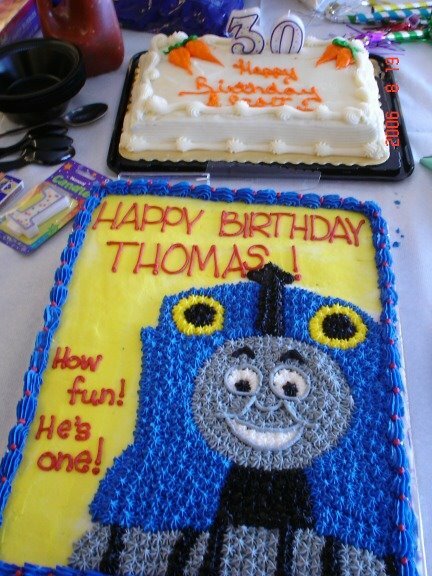 And do you see that Thomas the Tank Engine cake? Thank you DAISYCAKES OF ALLEN, who DONATED this EXTREMELY TASTY (and you have to know, I am a baked-goods snob) and GORGEOUS BIRTHDAY CAKE. Thomas got several trains and fun toys, and it was just such a blessing to have everybody together and celebrating our milestones - T's big day, Scott's 30th birthday, the end of chemo, and the beginning of maybea better year. We hope. With cake. I have been following your blog since the beginning...and I know for certain now that Angels really do exist. I see them and feel them in your beautiful pictures of Thomas, in your thoughts, in the miracles that have surrounded you and your family. 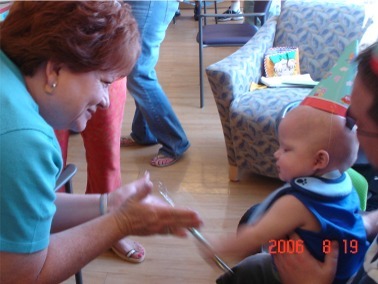 Thomas is a true testament to the power of God, love, family and miracles. Happy Birthday to the littlest of Bickles...and for Scott, tell him the best is yet to come....just wait until he's 40! Peace be with you always. P.S. My Grandma always told me that Angels never sleep! Peace be with you. HAPPY BIRTHDAY THOMAS!! get well soon. Awesome! You have a lot to celebrate! What a fun bday party!!! What a great turnout of friends/family and staff too! THIS grandma didn't take pics tho (i can't figure out why either?) so am counting on others to come through! My son is in Scott's science class so I have been reading this week. Thomas is absolutely precious and your courage and faith is so inspiring. God bless you all.